Conflict and Differences are actually a good thing. It means you are to some degree expressing your opinions and needs to your partner. When you both can do this, you will invariably bump into each other on occasion when these do not match up. Couples that do not have conflict and always communicate appropriately using fall into one of two categories. Either the relationship is so new and they have not run into this and the couple begins to develop rose colored glasses. Eventually conflict and communication differences will arise. A second category is a relationship where one or both partners have been beat down to the point where conflict has ceased because either or both of them are afraid to express needs and wants. Personality differences where it may be hard to stand up for yourself and so there are no disagreements. A healthy relationship will have conflict. Now there is no magic formula to how much or how little is good. However, we would say how often it is dealt with appropriately will often be the best indicator of the health of the marriage. 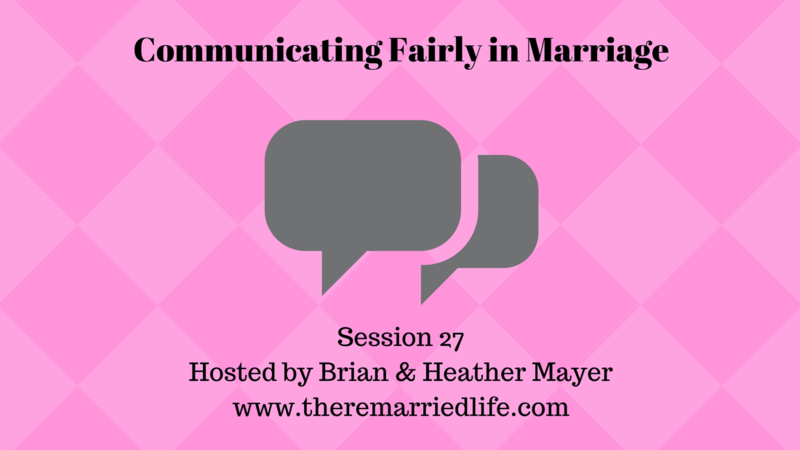 Let’s talk about some of the ways couples do not communicate or fight fairly. We will also talk about the solution to each of these ways in which we do not fight fairly. PROBLEM 1: Bringing other issues into the disagreement. You may remember a time that your partner either did the exact same thing or something similar, and you bring that into the argument. SOLUTION: Stick to the issue at hand. You need to resolve this issue on the table and not bring in other issues. The issues can better be resolved by sticking to it. PROBLEM 2: Saying “You Always” or “You Never” at the start of your statements. This is similar to the first problem in that you are bringing up past issues and you are turning the discussion away from the issue and into an attack on your partner’s personality. SOLUTION: Concentrate on your feelings about the situation, by starting with “I feel irritated” or “I feel sad when..” for example. PROBLEM 3: Making your goal that of winning the argument. You may feel so strongly that you are right, that you forget about the importance of the relationship. SOLUTION: Make sure to keep a balance of working on the issue while maintaining the relationship. Often conceding certain points to your partner regarding an issue can help you get to a healthy resolution. PROBLEM 4: Hold a grudge by silently stewing over an issue. In essence you are beginning to keep score when you do this. Often your partner has no idea you are doing this, and so while you think your partner has the issue it is really you. SOLUTION: Seek forgiveness in a timely manner. For some this is tough to do immediately, but it needs to happen. Forgiveness is simply telling the other person you are no longer holding the issue against them but it does not mean you trust or forget. This often takes longer. PROBLEM 5: Asking to discuss an issue at an inappropriate time. Trying to discuss an issue when one of you is tired or ready for bed is often not a good time. Trying to discuss an issue right when you get home from an extremely stressful day is also not a good time. Discussing something in public or in front of the kids is also not good. SOLUTION: Look for clues as to how partner feels and again whether or not it is a good time. Also simply asking if now is a good time, also helps! PROBLEM 6: Name calling. This is called contempt and is a way whether conscious or not to push your partner down to a level that is beneath you. Research shows that divorce will happen quickly the more this happens and research also shows that it has a physical impact by eroding the receiving partner’s immune system. SOLUTION: Obviously not doing this is best, but in order to stop you must visualize the best in your partner. That even though this situation is not good, they are a human being just like me. PROBLEM 7: Discuss something serious or something that bothers you while you have had alcohol. You can be taught all of the fair fighting skills in the world but if you have been drinking, none of these will work. SOLUTION: Wait until you are sober, before discussing the issues. If drinking has become a significant problem in your relationship whereby verbal or physical abuse has occurred depending on the severity, you must either seek professional help for the alcohol abuse or at worst seek a shelter if your safety is at risk. PROBLEM 8: One of you is talking much more than the other in a discussion about the issues. This could be a personality difference (think introverted or extroverted) or could be something more serious where one of you is oppressing the other. Either way is not good. SOLUTION: Equal time for each of you to discuss the issues is important. If you have trouble with this, use something visual like a spoon and only the person holding the spoon can talk. Obviously be fair and take turns without going on and on. PROBLEM 9: Turning away from each other or even arguing from different rooms or even different cities! SOLUTION: Body Language and facial expressions are so important and so squaring up to each other when talking to each other. You could even take it further by holding hands while discussing an issue. Lots of hugs throughout the process are good too. Remember disagreements are going to happen. It doesn’t mean your relationship is not healthy. It could actually mean the opposite. However, if you do not feel like you are sticking to some of these solutions we mentioned then there is work to be done. For most issues implementing these strategies should help a great deal to give you the relationship you want.